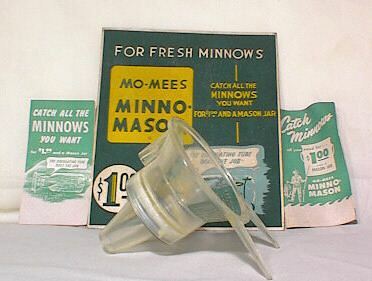 The Mo-Mees Minnow Trap The Mo-Mees Minnow Mason trap was sold by Champ-Items Inc. St. Louis, MO. It was patented in 1949 by E.H.V. Mohme and sold into the 1960's by various retailers. 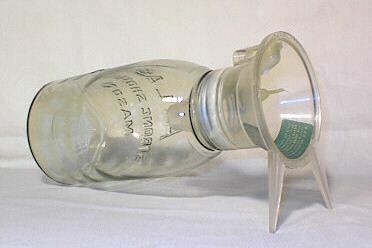 The plastic funnel screwed onto a common Mason jar and had a unique circulating tube which allowed water flow through the trap. "Catch all the minnows you want for $1.00 and a Mason jar."